Bake the pastry sheet in the oven and let it cool. Put the 5 kiwi, vanilla essence and lemon juice in a blender and make it a puree. In a pot, mix the sugar, salt with corn flour and pour the kiwi puree. Heat the pot until start simmering and mix continuously. Pour the eggs inside and continue to mix. After 5 minutes the composition starts to be thick and you can remove it from heat. 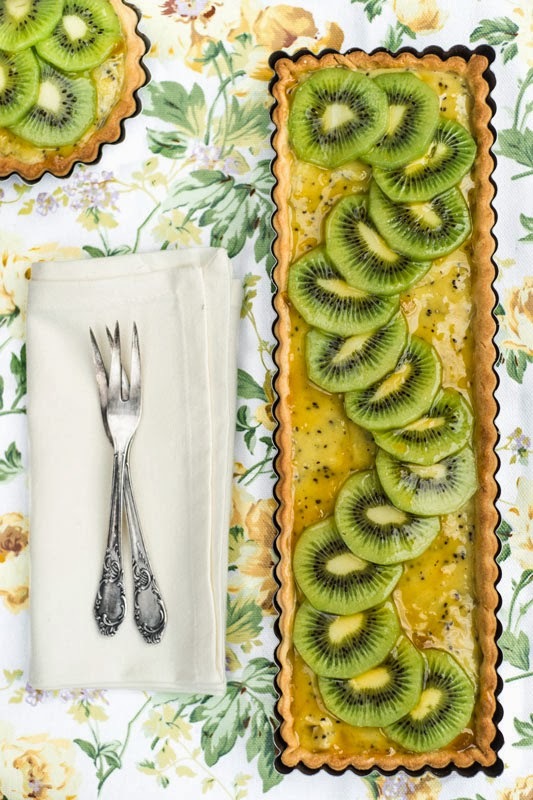 Fill the tart sheet with the kiwi composition. Decorate the tart with the slices of the remaining 3 kiwi. Brush the top of the tart with apricot jam (eventually diluted with a tablespoon of water if it is too thick) to avoid drying. Put it in the refrigerator for at least half an hour. My daughter didn't resist to put one finger in it ! Oh my! What a beautiful presentation! I love the way you lay out the kiwi slices. My husband is a huge fan of lemon tart. I bet he will love this. This recipe is simply amazing! I've been thinking of a recipe with kiwi and this one is THE one I need. Can't wait to try! Thanks :) Cheers from Del's cooking twist!